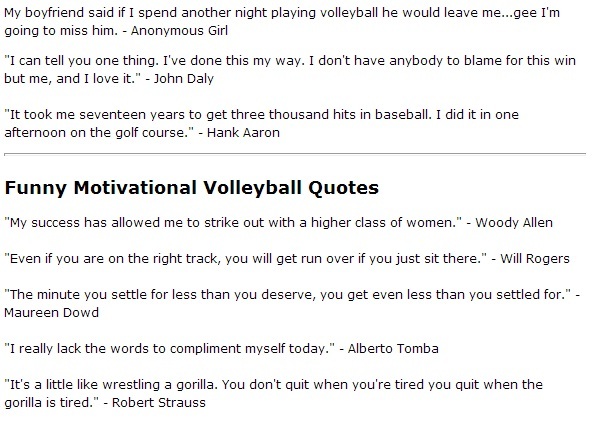 Are you looking for a good volleyball quote? 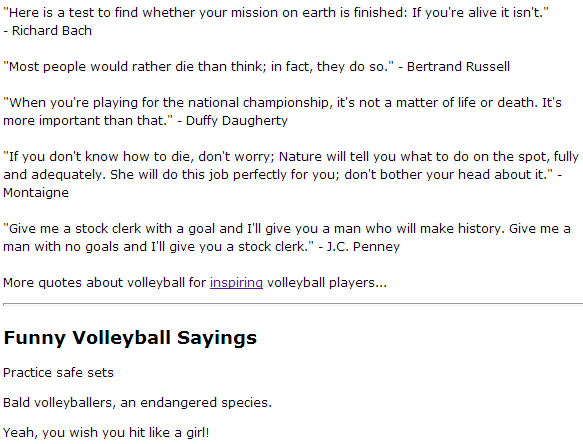 Funny quotes aren't just fun, but can also help you with volleyball. Believe it or not, laughing and smiling actually alters blood flow in the brain resulting in dramatic effects. When we are young, we first learn smiling is associated with happiness and feeling good. And it's difficult to think and feel different than ones body language. So if you're ever feeling down while playing volleyball, give smiling a try and see what happens. Volleyball Facial... Watch Your Face! We've all experienced playing tight and nervous. Visualization can help you relax. Positive talk can also help. Sometimes it's what you do off the court that makes you better on the court. Everyone knows that good rest and nutrition are keys to success in all parts of life. And certainly volleyball too. Be confident in yourself. Stay aggressive when making plays. Try to stay a positive as you can and be willing to take some chances. Don't worry about making mistakes. Mistakes are an important part of learning. Without mistakes you won't learn. Be expressive and positive about what your kid does well. Ask them how they can best support him or her. Instead of saying, "You need to run 4 or 5 miles this week like your coach said." Say, "I just love to see you working out hard and training to reach your dreams." "You don't know how good it makes me feel when you want to go out there and practice your skills." Instead of saying, "You've got to work harder than everyone else to get a Division I scholarship." Instead say, "It's going to be so exciting when you're playing volleyball at the Division I level. I can't wait to see you there being cheered on by your school and friends." Get your kid to buy into the dream. Paint the picture for them. Help inspire your kids. Help your kids own it. Talk as if it's already done. That's how they will create their own motivation. Ultimately the motivation has to come from them and not from you. If your child wants to be pushed, then ask them when they want that kind of support. If they aren't wanting to be pushed, then it's your goal and not theirs. Balance out the pushing with more inspiration and you can be a lot more influencial in your childs life. My boyfriend said if I spend another night playing volleyball he would leave me...gee I'm going to miss him. Cap'n Crunch Vball. (All killer, no filler) It's not just for breakfast anymore. You weak spikin', no blockin',net servin',face diggin',no passing, 15-0 losers.